Recently modest women have gotten significant attention: Articles in the New York Times, Vogue and others writing about Muslim women and Orthodox Jews who have fabulous style while adhering to their standards of modesty. As someone who is a modest dresser and who has been catering to the modest consumer, the attention produces mixed feelings. Mainly because results of this awareness yielded only small, limited-time collections for Muslims in the Middle East. Like this most recent Ramadan 2016 collection from Mango scheduled to be released on May 30th. It seems that the attention had no real depth. The collections do not properly address Muslim consumers and there has been no acknowledgment of the large global and diverse modest market. Thus, even with all the buzz, the majority of modest consumers are still left with little off-the-rack contemporary modest options. From an outsider’s perspective, the modest women may be an unfamiliar consumer. However, they want what every woman wants: to look and feel beautiful. She simply demands that her clothing have more coverage. It is akin to a plus size or petite customer, who does not want a different collection of plus size and petite clothing they want the same styles made to their needs. Similarly, modest women want the same styles in longer lengths and higher necklines. Modest women want the same thing all women want: to look and feel beautiful. They want the same mainstream styles with more coverage. The reason the fashion industry hasn’t been able to serve modest women (or plus size and petite women) adequately is simple: they have a severe crush on only one customer type. Everyone from legacy brands, new fashion startups, and department stores are fighting for the dollar of the same segment of the population: the cool, thin, young, middle class, city girl presumably willing to wear anything. This has left those who don’t fit that category — the vast majority of women — to fend for themselves. The fashion industry has a severe crush on only one customer type: the cool, thin, young, middle class, city girl. Ad from Missguided. A small segment of the population draws the majority of the fashion community’s attention. In recent years, the ease of starting an internet business has given rise to emerging designers who build brands that address women’s needs. Marketplaces like Etsy, and others have made it possible to get clothing that closely aligns with a customer’s needs, and in some cases, is custom made. This increase in emerging brands is being felt by name brands and retailers. Now, women who have been neglected by the fashion establishment are turning to these alternatives to find clothing that is designed for them. In the case of the modest consumer, name brands have been losing customers that only begrudgingly shopped their racks (mostly on sale, since they were never willing to pay full price for clothing that didn’t meet their needs). What’s interesting is that name brands don’t understand why they are losing ground. They cite generic reasons such ‘lack of newness’ and people no long buying apparel. However, they are not digging deep enough. For one, the young thin cool girl is a small population with an overabundance of options. More importantly, the root cause is that their business model excludes the most important component of any business: the customer. 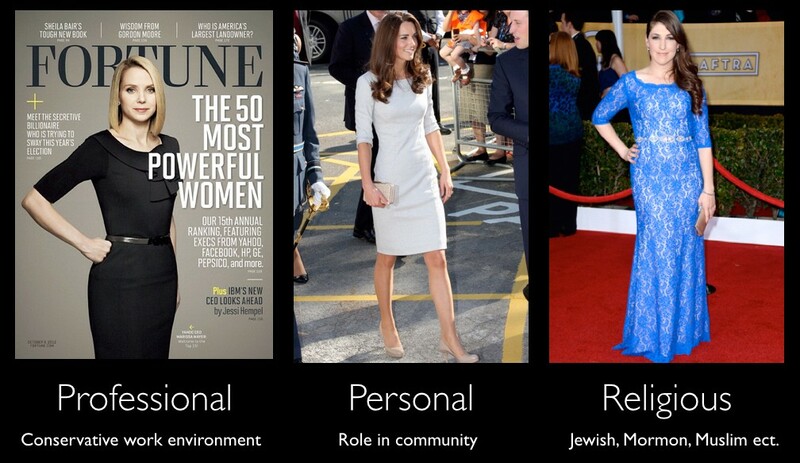 Brands don’t meaningfully engage with women they want to serve. They don’t consult them on designs, ask for feedback or decipher the reasons as to why one product sells out and another languishes on the racks. For this reason, brands are losing customers to emerging designers who talk to, understand, and often, are part of a particular customer group. These emerging designers are creating clothing that meet women’s needs because they’ve asked and listened to them. Consumer engaged brands like, Wildfang which caters to tomboys, and Elizabeth & Clarke which makes affordable workwear, can compete by listening to and addressing a need. In the case of Wildfang it fills a style gap of men’s inspired women’s wear. While, Elizabeth & Clarke addresses the need for timeless unstainable work wear. These consumer engaged brands have built a loyal customer base which allows them to compete with the fashion establishment. Fulfilling a gap is the only way a potential customer will risk a unknown online only brand that they cannot try on to check fit and quality first. Addressing a real need is the only way potential customers will risk trying an unestablished online brand. In the modest community there has been a tremendous rise of these online consumer engaged brands. It clearly shows that connection between women and the design process is the missing link for name brands. This is mostly because fashion historically has a stronger connection to art then it does to being a consumer product. Designers mistakenly believe they can dictate style from their corporate offices. Traditionally, design teams would put together collections based on color, trends, and silhouettes that the fashion establishment had decided was in. These styles would be pushed out onto the masses though aspirational images of models and celebrities on TV and print. Regardless of what women truly felt about the fashions, they bought them because they were ‘in’, their friends were wearing them, and most importantly, there were little alternatives. The fashion establishment has put too much emphasis on art and not enough on it’s role as a consumer good which must address consumer needs. That approach no longer works, before the internet it was cumbersome to find alternative styles, so many modest women settled — using tailors and layers to make what was available work. Name brands may not have realized it, but their sales in those days were largely driven by convenience and lack of alternatives rather than a love for the offering. Now that there are more convenient alternatives, name brands can no longer rely on celebrity endorsements, aspirational value, trend setting, and discounts to drive sales. Everywhere, brands and retailers are feeling the decrease in sales and a new marketing strategy is not the solution. Modest consumers are no longer passively accepting these offerings, modest consumers are seeking out clothing that meets their needs. Brands rely on setting trends and aspirational messaging to drive sales. They never truly engage customers. What about fast fashion retailers, they seem to be flourishing? They are doing better than name brands, but it’s because they’ve chosen to play a different game. The single most important driver of Zara, H&M and Forever21’s sales is the speed of their inventory turnover. When a modest consumer sees something she remotely believes can work for her, she is driven to buy it because if she waits, she may never be able to find it again. The pricing makes it nearly irresistible, reducing the friction and closing the sale. Still, when we talk to modest women, we find that they are not buying the item because it meets their needs or because they love it. Fast fashion doesn’t have time to consider customer needs, they produce items so quickly and cheaply that the fear-of-missing-out drives sales. Neither name brands or fast fashion truly engages with customers. They each use their own gimmick to drive sales. Brands use aspirational lifestyle and status as motivators while fast fashion relies on speed and low prices to provoke a fear of missing out. Both approaches fail to meaningfully address customer needs, which has left room for modest consumer engaged brands to enter. It’s only a matter of time before these modest consumer engaged brands gain in status and increase their capacity to have larger selections at a faster rate. When that happens they will have established customer trust, status, and fast production capacity which will allow them to capture significant marketshare from incumbents. By that time it may be too late for incumbents to recover. Today more and more consumer engaged brands are emerging that meaningfully understand and listen to their customers; providing options that solve real needs. Thus the path forward to win the modest market is clear: talk to and listen to modest women. Name brands have the most to gain from this approach as they have been hit hardest by the loss of dissatisfied customers. Their status, quality, and aspirational value provide many intangibles that modest women still desire. In our interviews we’ve found that modest women would be willing to pay a premium for those intangibles, provided name brands produced clothing that truly took their lifestyle and needs into consideration. Modesty is extremely personal and comprises many factors such that one universal definition of modest clothing does not exist. However, for fashion brands, the modest consumer can be segmented into general groups with clear guidelines. At a minimum, clothing that is modest does not show cleavage, has sleeves and comes to the knee. Many communities and religions prefer more coverage than that. 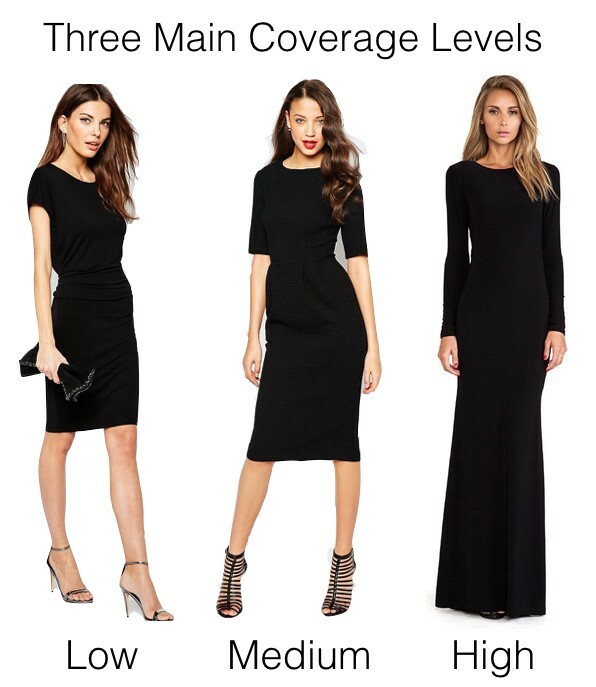 Below are the three main levels of coverage modest women fall into low, medium and high. Throughout the world women choose to dress modestly for professional, personal and religious reasons. Many women who work in corporate offices or male dominated fields, may prefer to present a more conservative work appearance. For other women, they have personal reasons like skin conditions, sun protection or their view of their status in their community or family. Finally, women of any of the world’s major faiths may adhere to their religion’s standard of modesty. Whatever the reason, these women shop with neckline and hem lengths as top priorities and evaluate clothing according to that criteria. Currently, the modest market has been most strongly equated with the Muslim market, which alone is estimated to spend $484 billion on clothing by 2019. Once you add in the modest consumers in the different segments outlined here that market is even larger. What do modest women want? It’s quite simple, modest women want brands to offer them their same styles with more coverage. Your brand’s aesthetic, the same or similar items from your current collections with more coverage. Collections displayed on models and in a way that resonates with modest consumers. Easily available to customers all over the world. Similar price points to your current lines. Limited time only collections, i.e. only for Ramadan. Geographically confined collections, i.e. sold only in the Middle East. Modest consumers want the same styles with more coverage. For the modest consumer who has been left out of mainstream fashion, a brand that takes steps to meaningfully engage her will be met with interest, excitement, and most importantly- sales. Zahra is a modest dresser and the co-founder of Mode-sty the first multi brand e-commerce to cater to modest women. If you want to know more about the modest fashion market email stylist@mode-sty.com for the comprehensive white paper on the topic . Supporting Muslims to achive true sucess in this life and the next. The bigger your dream, the more excited I am. I’m a mindset coach who questions everything.